1. Facing forward, lift the thigh to the side of the body with the knee pointing out to the side. 4. Bend the leg back keeping the knee forwards to act as a guard. 5. Return the leg to a stable posture. When performing the kick free-in-air, it may help to pull back the forward arm to act as a counter balance to prevent 'overshooting'. Note that this is not required when striking a solid target as the impact itself provides the backward force. 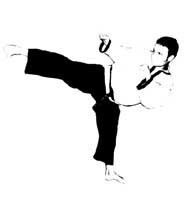 In a combat situation, the shin can also be used as the striking weapon. The speed of the technique can be increased slightly by using the foot to 'push off' from the floor during the initial lift. Power is sacrificed for speed in this case and the 'round' tragectory of the foot is cut much shorter. c) Since contact is light, The instep can be used as the striking area.